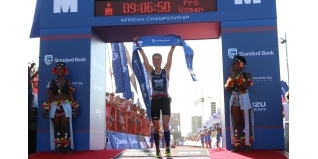 Kaisa Lehtonen (FIN) earns her first Ironman title at Ironman South Africa, to take $30,000 prize and guaranteed Kona qualification. A great swimmer, Jodie Swallow was in a very familiar position – alone and clear at the head of the women’s 3.8km swim. A 52:11 split was almost four minutes quicker than Australia’s Annabel Luxford. While that of itself isn’t (surprising) news, it shouldn’t be taken for granted. Swallow is, and has been, at the peak of women’s triathlon swimming over every distance for 15 years now – kudos to her for maintaining her standards of excellence. Her performances make forecasting very easy – but we know the efforts that go into making it happen. Luxford is a class athlete, a relative newcomer to Ironman racing, but she did finish 12th in Kona last year at her first attempt at the Ironman World Championships. Susie Cheetham (58:21) and Lucy Gossage (1:03:20) were the other leading Brits from last years podium, with Cheetham in the company of Kaisa Lehtonen (FIN), Bronze medallist last year in the ITU World Long Distance Championships in Sweden. She would be a serious challenger today. Swallow’s progress and attempts for back-to-back wins at a venue she knows well were halted on the bike leg by a crash. The details we don’t have at the time of writing, but Swallow did get back up and finish the ride (still in second place, with a split of exactly five hours), but the impact would soon leave her out of the race. With Swallow’s problems, Annabel Luxford took the lead on the new bike course and would reach T2 clear with a race best 4:49:17 bike split. 13 minutes later Lehtonen (4:59:41) arrived together with Gossage (4:56:10), who had made up her five minutes swim deficit on Cheetham in her strongest discipline. A fine runner, Susie arrived a further three minutes back alongside Asa Lundstrom (SWE). Thus, with Swallow out of the race, Luxford had a big lead with the pairings of Lehtonen/Gossage and Cheetham/Lundstrom ready to chase her down over the marathon. 13km into the run Luxford was still clear, but her lead had been cut significantly by Lehtonen to just seven and a half minutes, with Gossage at 11 minutes… but now with Cheetham alongside her. All three were making up time on Luxford, but Lehtonen and Cheetham were closing the quickest. With 10km remaining it was all change – Luxford was heading backwards fast, and Lehtonen was now holding the lead, four minutes clear of Cheetham who had passed Gossage on the run, with the Duracell Bunny now third a further 90 seconds back. Luxford was going to be struggling to hold a top five position now with Lundstrom also closing fast. While the Brits tried, this was going to be Lehtonen’s day in only her second Ironman. She also took second place (in a sub-nine hour time) at Ironman Barcelona last year. Gossage came good in the final stages of the run to close a few second back on Cheetham in the final kilometres, but it wasn’t going to be enough, as the Brits swapped their final finishing positions from the same race 12 months ago.